We recommend using FileZilla. FileZilla works on multiple platforms and is completely free. In FileZilla, navigate to File > Site Manager then click New Site. Log in to the control panel to find your FTP details under Files > FTP File Access. 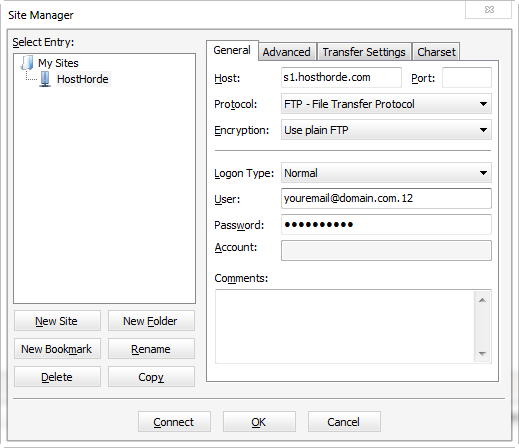 Copy the host and port from your control panel into FileZilla's Site Manager. Under Logon Type, select Normal, then enter in your username from the client area and your password. Please note: The port used for FTP will always be 21 and is not the same as your minecraft server; and your username for FTP will be slightly different from your control panel login. Please ensure these details are correct, or you will not be able to connect.